Once again we want to talk about this subject. With schools being out for the summer and pools open for the season, this is another “game” that youth and even adults will try. It is very similar to the choking game . 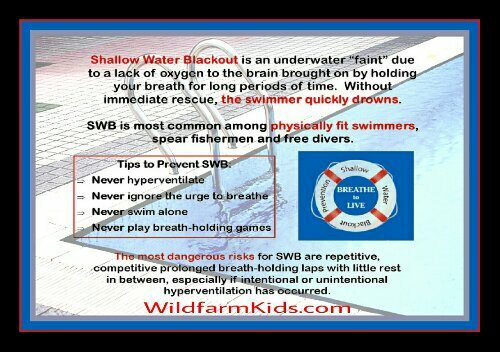 Shallow water blackout (SWB) is caused by competitive or continuous breath holding or by taking several deep breaths before diving under water. Swimmers pass out due to lack of oxygen and the delayed trigger to breathe means they passout. When this happens, death or brain damage occurs much quicker than the usual form of drowning. Make sure you don’t leave children unattended in pools or near water. We hope you share this information not only with friends and family, but also the children in your lives too. Have the conversation each time your kids swim, even if only to remind them. SWB can be prevented. Happy Summer and Swim Safe!